Grand Prize winner: Long-snouted seahorse (Hippocampus guttulatus), Croatia, Plavnik. Photo by Lars Reichenbach/Guylian Seahorses of the World. We are delighted to announce the results of this year’s Guylian Seahorses of the World Photography Competition. Congratulations to Lars Reichenbach and Danny van Belle, they are our 2018 Grand Prize winners! 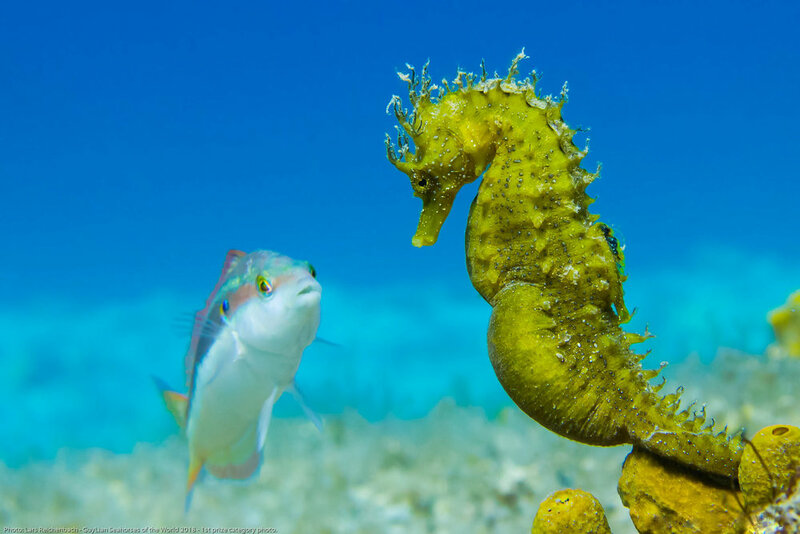 Lars’ beautiful photo of a Long-snouted seahorse (Hippocampus guttulatus) “having a conversation” with a Mediterranean rainbow wrasse (Coris julis) put a smile on our face, while Danny amazed us with a gorgeous compilation of seahorse video clips. The winning photographs and video were unveiled at the NELOS International Underwater Photo & Video Festival held on November 17th in Beringen, Belgium. The Seahorses of the World category is sponsored by Guylian Belgian Chocolates, who are renowned for their commitment to marine conservation and of course their decadent seahorse and sea-shell shaped chocolates. We received so many amazing entries that it was a really tough decision to narrow it down to only a few. We can’t thank all the participants enough for their wonderful contributions. We received a record number of submissions. THANK YOU! This contest is invaluable to seahorse conservation, as photography is a potent medium for fostering respect for aquatic life. This contest provides a platform for all underwater photographers, from fledgling ocean enthusiasts to seasoned aquatic artists, to showcase their talent while raising awareness of the plight of these fabulous fish. Winning photos were selected based on a variety of criteria, most notably their scientific and artistic value. This year, the competition had a number of categories, the Grand Prize, the Public Prize, the iSeahorse Prize and the Hugyfot Best Seahorse Prize. The Grand Prize winners were determined by a panel of experts in the fields of underwater photography and seahorse biology. The Public Prize allowed the public to vote online for their favourite submissions, and the most popular pictures were shortlisted for further evaluation by the adjudicators. The iSeahorse Prize was randomly chosen from the competition photos that had also been submitted to iSeahorse.org, and Hugyfot had their pick for the Hugyfot Best Seahorse Prize. Lars Reichenbach was presented with the 1st Place Grand Prize for a Photo: a Hugyfot Vision housing for GoPro 5/6 (or for Sony RX-100), complete with Hugyfloat arms and an Arius 1500 video light kit and a Guylian prize package. The Grand Prize for a Video was awarded to Danny Van Belle: an Arius video light kit (2 video lights 1500 lumen) and a Guylian prize package. The 2nd Place Grand Prize was a Greenforce GFI scuba light (1650 lumen) and a cheque worth 200 EUR to spend in a diving shop and a Guylian prize package, awarded to Zhang Jinggong . We had a tie for 3rd Place - Janny Bosman and Gino Symus, who each won a cheque worth 250 EUR to spend in a diving shop and a Guylian prize. 2nd Grand Prize: “Love Dance” Korean seahorse (Hippocampus haema) mating in Kumamoto, Japan. Photo by Zhang Jinggong/Guylian Seahorses of the World. 3rd Grand Prize (tie): “Happy together” Thorny seahorse (Hippocampus histrix) in Negros, Philippines. Photo by Gino Symus/Guylian Seahorses of the World. 3rd Grand Prize (tie): “Yellow one” Short-snouted seahorse (Hippocampus hippocampus) Playa Chica, Lanzarote. Photo by Janny Bosman//Guylian Seahorses of the World. As for the Public Prize winners, each won a stash of Guylian’s coveted confectioneries worth 20-50 euros. The Public Prize recipients were Ronny Bartholomeeusen (1st Place), Yves Guénot (2nd Place), Rui Palma (3rd Place), Gunther Meiresone (4th Place) and Annelies De Pessemier (5th Place). 1st Public Prize: “Lookalikes” Barbigant’s pygmy seahorse (Hippocampus bargibanti) in Raja Ampat, Indonesia. Photo by Ronny Bartholomeeusen/Guylian Seahorses of the World. 2nd Public Prize: Denise’s pygmy seahorse (Hippocampus denise) in Raja Ampat, Indonesia. Photo by Yves Guénot/Guylian Seahorses of the World. 3rd public prize. “Seahorse face” Long-snouted seahorse (Hippocampus guttulatus) in Sesimbra, Portugal. Photo by Rui Palma/Guylian Seahorses of the World. 4th Public Prize: Jayakar’s seahorse (Hippocampus jayakari) in Dahab, Egypt. 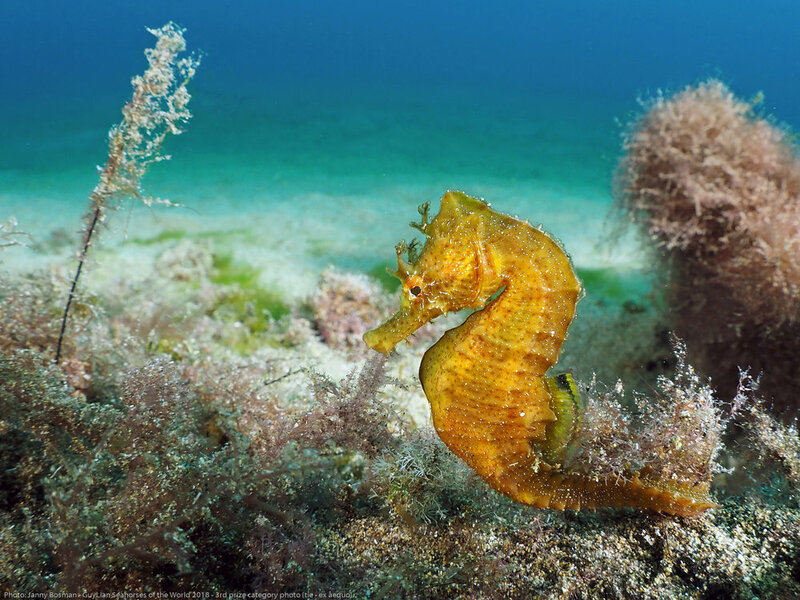 Photo by Gunther Meiresone/Guylian Seahorses of the World. 5th Public Prize: Thorny seahorse (Hippocampus histrix) in Anilao, the Philippines. Photo by Annelies De Pessemier/Guylian Seahorses of the World. The Hugyfot Best Seahorse Prize was awarded to Brad Pryde, who received a Hugyfot Slingbag (bag for photo equipment) and a Hugyfot surprise packet. Winner of the Hugyfot Prize: “Field of Dreams” West Australian seahorse (Hippocampus subelongatus) in Perth, Western Australia. Photo by Brad Pryde/Guylian Seahorses of the World. And finally, but not least, the iSeahorse Prize went to Dirk Crutelle. He will be receiving a signed copy of 'Seahorses – A Life Size Guide to Every Species' by Sara A. Lourie. Winner iSeahorse Prize: Thorny seahorse (Hippocampus histrix) in Ambon, Indonesia. Photo by Dirk Crutelle/Guylian Seahorses of the World. Competitors who didn’t win formal prizes were eligible to receive a Guylian gift bag if they attended the NELOS Festival. Once again a huge thank you. By capturing these magical animals on camera, we are offered a tangible connection to what we stand to lose if maintaining marine biodiversity isn’t a priority. View all the submissions in the Guylian photo gallery: http://seahorses.guylian.com or at https://flic.kr/s/aHskJjiYVg. You can also find many of the current and previous Seahorses of the World entries on iSeahorse.org, Project Seahorse’s citizen science initiative.